When you take out a loan, whether it’s a car loan, home loan or credit card, you’ll have to pay back both the amount you borrowed and interest on top of it. But what do we mean by that? Well, essentially, interest is a fee you pay for using someone else’s (usually the bank’s) money. It’s how lenders make profit from giving out loans - after all, they’re not in it out of the goodness of their hearts. Usually the repayments you make on a loan will be made up of two parts: the part that reduces your balance to pay off your loan, and the part that covers the interest on the loan. You’ll need to know a few basic facts about your loan before calculating how much interest you’ll pay. All of these things should be freely available to you before you take on the loan - you’ll find them on Mozo’s loan comparison pages - and it’s a good idea to know them all anyway, even if you’re not trying to calculate interest. How long will you be repaying your loan? Shorter loan terms will generally mean higher repayments, but less interest in the long run, while longer terms will lower monthly repayments, but cost more in interest over the entire life of the loan. $413 each month, adding up to $4,765 in interest over 5 years. On many loans, you’ll have the option to make repayments weekly, fortnightly or monthly. Which one you choose will depend on your budgeting style. 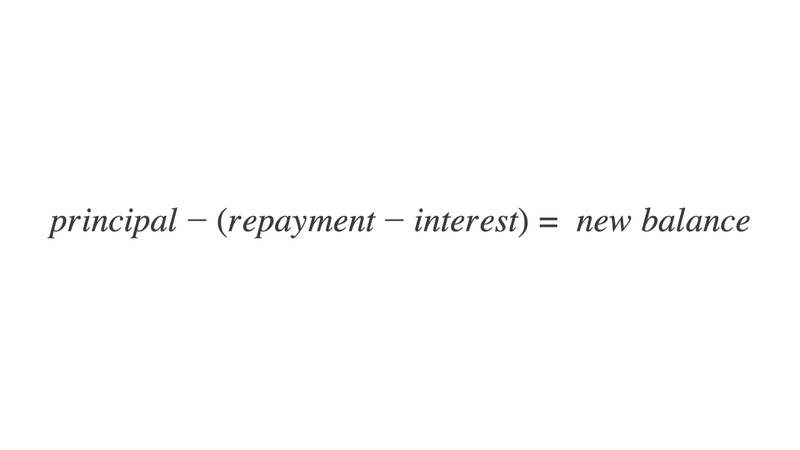 More repayments means less interest, because of the effects of compounding, so weekly repayments will save you some money. But before you commit to a weekly repayment schedule, make sure that your budget can meet it! When you make your repayment, not all of it goes to paying off your loan, as such. A certain amount will go towards paying the interest first and then what’s left chips away at your loan principal. 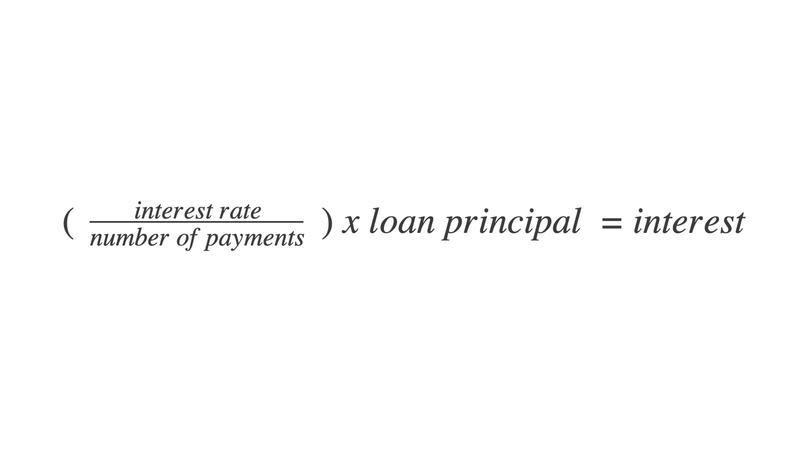 Because the amount of interest you pay depends on what your principal is, to calculate ongoing interest costs, you’ll need to know what amount you’re making in repayments. When calculating interest on your loan, remember to use the basic annual interest rate and not the comparison rate to get accurate numbers. The comparison rate takes into account fees and charges as well as interest, so if you use it, you will get a higher amount of interest than you should. These loans are called amortizing loans - which means that the mathematical whizzes at your bank have worked them out so that you pay a set amount each month and at the end of your loan term, you’ll have paid off both interest and principal. 1. Divide your interest rate by the number of payments you’ll make in the year (interest rates are expressed annually). So, for example, if you’re making monthly payments, divide by 12. 2. Multiply it by the balance of your loan, which for the first payment, will be your whole principal amount. This gives you the amount of interest you pay the first month. 1. Minus the interest you just calculated from the amount you repaid. This gives you the amount that you have paid off the loan principal. 2. 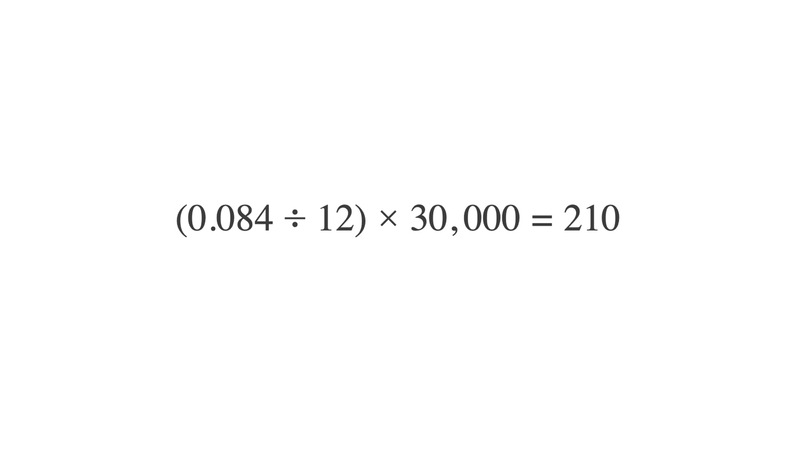 Take this amount away from the original principal to find the new balance of your loan. Keeping in mind that doing the calculations yourself means slight discrepancies due to rounding and human error, this should give you a pretty good idea of what you’re paying in interest each month. Taking out a home loan? You might have the option to choose between a principal and interest loan or an interest only loan. As the name suggests, if you choose to take out an interest only loan then your whole monthly payment will be going toward interest. You won’t be chipping away at your principal amount, which means the amount of interest you pay won’t change. In the above example, you’d pay only $210 in interest each month, and then at the end of the 6 years, you’d have a lump sum of $30,000 to pay in full. It’s a good idea to think of using a credit card as taking out a loan - it’s money that is not yours, you’re paying to use it, and it’s best that you pay it back as soon as you can. your basic repayment is a minimum amount set by your credit card company. It might be a set dollar amount, similar to any other loan, or it might be a percentage of your balance. It’s best to pay more than the minimum amount, because often, it doesn’t even cover the cost of interest. Paying only the minimum is how you wind up with a massive credit card debt. if you make purchases on your card before paying off previous amounts, it will be added to your balance and you’ll pay interest on the whole lot. This will change your minimum payment amount as well, if the minimum payment is based on a percentage of your balance. It’s always a good idea to pay off as much of your credit card balance as you can, as early as you can - that way, you avoid getting hit by high interest rates! So when you’re calculating your interest, just remember to use the right amount for your repayment value and add any extra purchases onto your balance, and the above method should work to calculate your interest. If all of that looks like way too much math to stomach, or if you don’t have time to become a spreadsheet expert, you can use our handy financial calculators to do the work for you. Our repayments calculators will tell you the repayment you’ll make on a monthly, fortnightly or weekly basis, and give you the total amount of interest you’ll wind up paying on your car, personal or home loan. And our credit card debt payment calculator will show you how long it will take you to pay off a credit card debt, plus how much you’ll pay in interest and fees. This week in banking - Apple announces new credit card, but when will it arrive in Australia?